The coherence of this programme is not really evident, despite a lengthy ‘explanation’ written by the singer himself in the booklet. Expert's essay is a sort of reflection about the notions of sacred and profane, but it contains some glaring historical mistakes (including some optimism about the number of operas and oratorios composed by Handel, and a comment about the composer being an excellent trumpeter and oboe player, which seems to be a revelation!). Expert's vision of Handel reminds me of the 19th century romantic approach to musicography. Irrespective of Expert, this CD is an occasion to appreciate the accuracy, colours, finesse and expressiveness of the ensemble Amarillis. Throughout the entire CD, its performances are highly enjoyable, and despite its small number, the music never sounds narrow. The other feature of particular interest is the première recording of a version of Mi palpita il cor that has a solo oboe part in the last aria. This oboe introduces a very nice shade in the pastoral colours of the cantata. 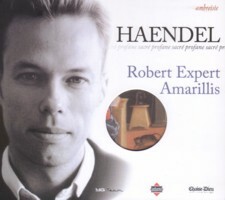 Robert Expert’s performance is quite erratic. The voice seems to not always be at its right place, and his lack of control results in occasional instability, in which registers are not properly unified. Diction is sometimes very poor (see the arias in English). Expert's musicality and involvement more or less manage to compensate for the vagaries of his singing. The Italian pieces are the most convincing vocal performances, and the duet from Rodelinda with soprano Patricia Petibon works quite well, even though both singers could seem to be cast against type.